Boomtown is a pop music festival which takes place in Ghent every year during the “Gentse Feesten”. With MLA we’re not only using a great sound system, the MLA system is also an asset in sound control. 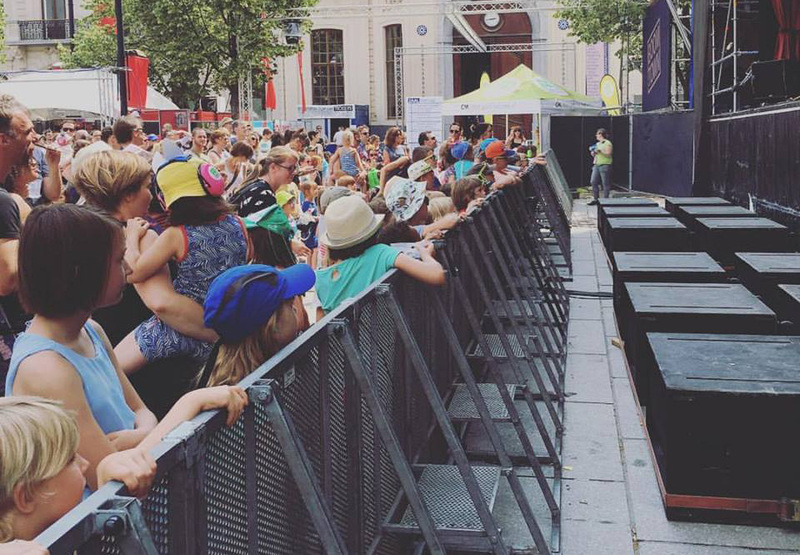 It’s a winning solution at city festivals where noise pollution is an important topic. The full light and sound installation at the “Kouter” in Ghent at Boomtown festival is provided by ARC Productions. They are specialized in sound, light and video projection and you can always refer to them from a custom-made design to a perfectly delivered production. To let Boomtown’s visitors fully enjoy their favourite national and international bands, ARC Productions worked with 16 Martin Audio MLA Compact as main system, 8 MLA Mini as delay system, two W8VDQ loudspeakers as infill, and 12 WS218X sub-bass systems in a matrix configuration. For on stage monitors, ARC Productions provided the necessary LE1500 high performance stage monitors. The MLA Multi-cellular Loudspeaker Array delivers dramatically increased level of performance and consistency of audience coverage compared to conventional touring arrays. Unlike line arrays ─ which aim to produce iso-phasic wavefronts as they exit from the array (usually up in the air in real-world applications) ─ MLA cellular technology is designed to achieve phase-coherent summation across the audience itself. MLA technology gives the system tech the tools to control sound throughout the venue with absolute confidence and the FOH engineer can mix knowing that the balance set at the mix position will be heard everywhere. For the Boomtown festival, ARC Productions uses MLA Compact and MLA Mini to keep noise pollution as low as possible. The Martin Audio W8VDQ combines line array and differential dispersion technologies to provide an advanced solution to the requirement of even coverage over wide angles and throw distances. The resultant dispersion pattern is ideally suited to cover audiences located in front of the Boomtown stage. Martin Audio’s WS218X is high performance sub-bass system which is designed for use at medium to large event locations. By placing the sub-basses in a matrix configuration, controlling the radiation pattern of the sub frequencies happens at a very efficient way. In this configuration, there’s a significant reduction on the back and the sides of the sub matrix but maximum power and tonality are kept in the listeners’ area. By using an ‘hard avoid area’ on stage in the design of the MLA Compact combined with the level reduction at the back side of the sub matrix, a quit stage is created which musicians and monitor tech will appreciate very much. To learn more about MLA Technology you can visit the dedicated “Introduction to MLA Technology” seminar at our FACE Seminar Sessions. For more information about MLA Technology, you can contact Jeroen Willems or Hugues Rogie or visit martin-audio.com/products/MLA.